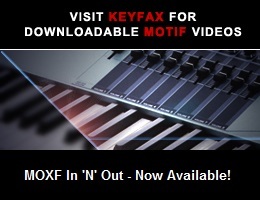 Viewing topic "S90XS vs Motif XS and Alesis QS8.1"
I am interested in the S90XS. I currently have an Alesis QS8.1 and a Motif XS6 and I’m planning on replacing both for a single S90XS however I would like to test it first specially to feel the keys and confirm how close to a piano key they are, the problem is that I live in Costa Rica and Juan Bansbach (the official Yamaha Distributor) does not have nor are planning to bring such piano for testing only if I pay them up front they will bring it but as you know I want to test it before purchasing it. - The keys feel like a real yamaha acoustic piano? - Compared to an Alesis QS8.1 or to a Roland RD700NX, they keys of the S90XS are similar or better than the ones on those models and are more “piano like” ? - The S90XS keys are the same keys the Motif XS8 has or they are an improved version of the ones in the motif ? The keys feel like a real yamaha acoustic piano? Of course Yamaha makes real acoustic piano’s but in their digital world there are 2 types of weighted keyboards: graded hammer action and balanced hammer action. With a graded hammer action it works exactly as on a real piano: the keys will gradually become lighter when playing from the left to the right. With a balanced hammer action keys all keys weigh the same. It’s a perfect balance that enables you to also play more modern keyboard sounds like organs, synths,… And it also has aftertouch which I believe is not available on the graded hammer keys. Maybe you can try to find a shop that has a yamaha keyboard with the same keyboard as on the S90XS. As far as I know, the same keyboard action is used in the following instruments: Yamaha Motif 8, Motif ES8, Motif XS8, Motif XF8, S90, S90ES and of course the S90XS. Chances are that you’ll will find at least one of the above instruments to try out. The balanced hammer action on the S90XS is one of its great features and Yamaha seems to agree ;) because they’ve been using it for more than a decade. If you’re looking for an exact, authentic piano feel, especially if your a (classical) pianist, then you’ll want to check out one of Yamaha’s keyboard instruments with a graded hammer action like the Clavinova CLP/CVP series or the new CP1 or CP5. If you’re looking for a versitale, weighted keyboard for playing piano but also organ, synth and other sounds, then you’ll certainly want to try there balanced keyboard instruments like the Motif 8/ES8/XS8/XF8, S90/ES/XS. And, it has aftertouch as well. Almost 10 years ago I played on a Yamaha P120S with a graded hammer action. Then I went on with a Motif 8, later a Motif ES8 and since a few months I’ve teamed up with an S90XS. When you’re trying out a keyboard instrument, make sure it is placed on a decent stand so you really can get a good feel of the keys and the action. Thanks for the reply man. BTW great explanation. Now I know things didn’t know before. I’m not a formal classical pianist but I personally think if I want the exact same feeling is better to get the real deal the actual acoustic piano, however I do not have the money to get one and I am looking for the closest one experience. That’s why I purchased some years ago the Alesis. Based on that and your explanation then I think the S90XS is a really good option. Now, are you 100% positive the Motif, MOtif ES, Motif XS, MOtif XF, S90, S90ES, S90XS have the same keyboard type/feeling/hammer action? I was under the impression they were not. But if they do, it will be easir to find some one with a motif to get the feeling of the keys and then make my final decision. Actually there’s an extra type of weighted keyboard controller in Yamaha’s arsenal: both the CP1 and CP5 use NW Stage action (using natural wooden keys). The other stage piano’s like the CP33, CP50, CP300 use graded hammer action. Also with their CLP/CVP series there are models that have wooden keys but these instruments are hardly portable. I believe Clavia uses a FATAR keybed. Also, remember that almost any keyboard controller can be ‘adjusted’ to your playing style using velocity curves. This enables you to use a lighter/heavier playing style. Seems like something simple but it can have a huge impact on how you experience the keys. - make a decision based on your personal experience by actually playing it and not just reading about it. I still am glade I choose the S90XS. Normally I would have bought the Motif XS/F 8 but the size and weight makes it less ‘gig-friendly’. The S90XS and especially the S70XS are much easier to carry around. being able to increment/decrement the keys in semitones directly from the control surface is really handy. I know, I should probably learn to play in different keys, but he ... technology works for me right :). And you can even shift complete octaves and that is very rare on a weighted 88 keyboard controller. Quickly layer and/split sounds using performance creator. And it also is very easy to add some drums and arpeggiators. Maybe I’m a bit too biased but I really like my S90XS.